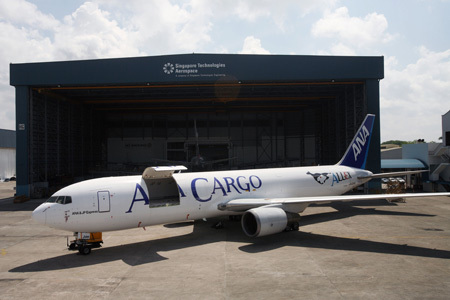 SINGAPORE, June 16, 2008 -- The ANA (All Nippon Airways) jet began its transformation from a passenger airplane to a freighter on Oct. 18, 2007, when it arrived at ST Aerospace's subsidiary ST Aviation Services Company (SASCO) in Paya Lebar, Singapore. On April 10, Boeing test pilots flew the airplane from Singapore to Seattle, followed by two months of flight testing. The 50-ton-capacity freighter flew nonstop to Seattle, completing the 14-hour, 51-minute flight at 10:13 a.m. the same day, but 15 time zones away. Boeing began its ground testing and certification program immediately thereafter. The prototype passed its flight tests with outstanding results and was flown back to Singapore on May 26. This Boeing Converted Freighter meets Boeing's demanding standards for quality and consistency. BCF airplanes are economical to maintain and operate. This assures the highest value in the freighter market. With more than 30 years of successful passenger-to-freighter conversion experience, original design data and a deep understanding of the production freighters, Boeing offers something no one else can, conversion by the original equipment manufacturer.